Pineapple Processing - TS Designs Inc. Serve up freshly cut pineapple to your clients with help from TS Designs Inc. in Burley, Idaho. 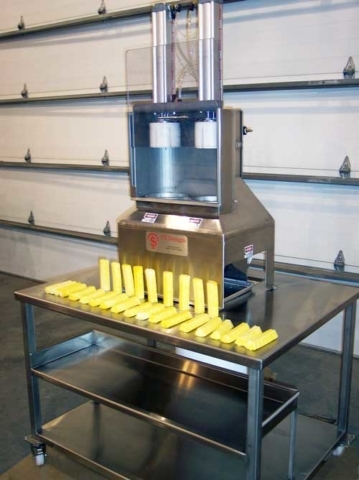 Many types of pineapple processing equipment for small, medium, and large food processors are currently available.This includes pineapple spear, pineapple true tube machines and pineapple topper/tailor. A vertical pineapple peeler is also coming soon. Many customers will not buy pineapple unless it comes cored and cut up. The pineapple spear and pineapple true tube machines allow your facility to quickly produce an abundance of freshly prepared fruit that is ready to eat. 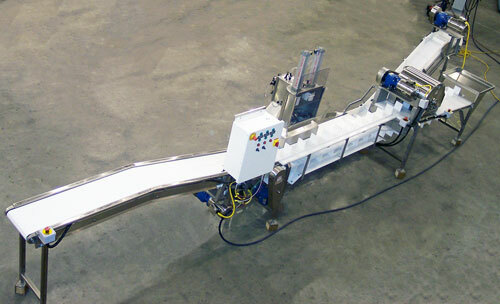 Made with an all stainless steel, wash-down construction, these machines use a pneumatic system. The pineapple processing equipment includes a peel separation and removal chute to quickly prepare the fruit for coring and cutting. In order to handle fruit of any size or shape, custom blades are available for the peel, wedge, and core sizes. 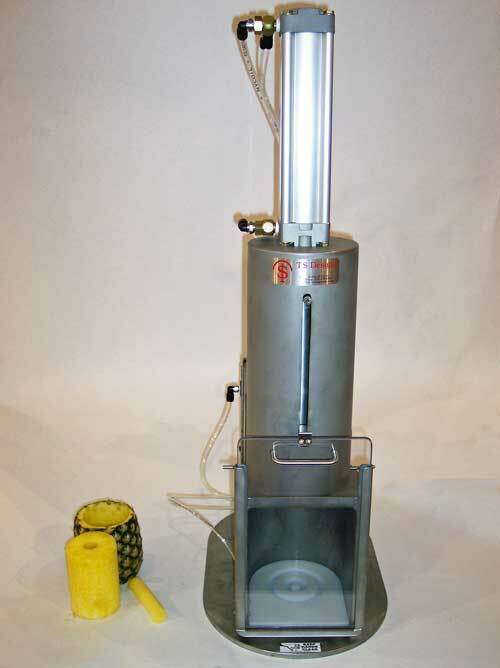 Features of the pineapple spear and pineapple true tube machines include safety covers and switches. Also an auto open door, and quick-remove blades and push pads. 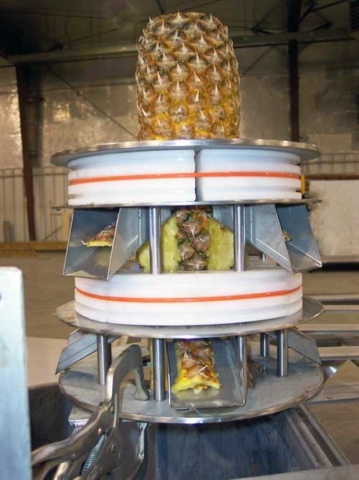 Call (208) 878-3000 for more details on pineapple processing equipment. 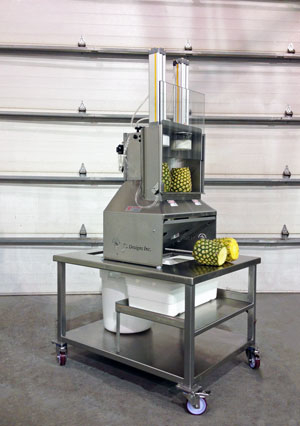 The pineapple topper/tailor machine allows you to present your clients with a pineapple that is fully prepared to be cut into. 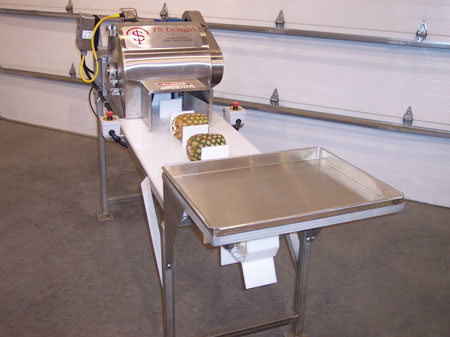 Like our other pineapple processing equipment, the pineapple topper/tailor is made with an all stainless steel, wash-down construction. Adjustable cutting blades are available for different widths, so you can efficiently process fruit of all sizes. It comes with a quick adjustable product guide. Other main features of this pineapple processing equipment are a waste removal chute, a variable speed drive, safety covers and switches, and a stainless steel motor and bearings. Call (208) 878-3000 for more information on the pineapple topper/tailor and how it can help your operations go faster. Contact us in Burley, Idaho, for more details on the different pineapple processing equipment available. The firm proudly serves clients throughout the United States, Mexico, and Canada.